After Broome we were heading east into the vast Kimberley and the start of the Gibb River Road. 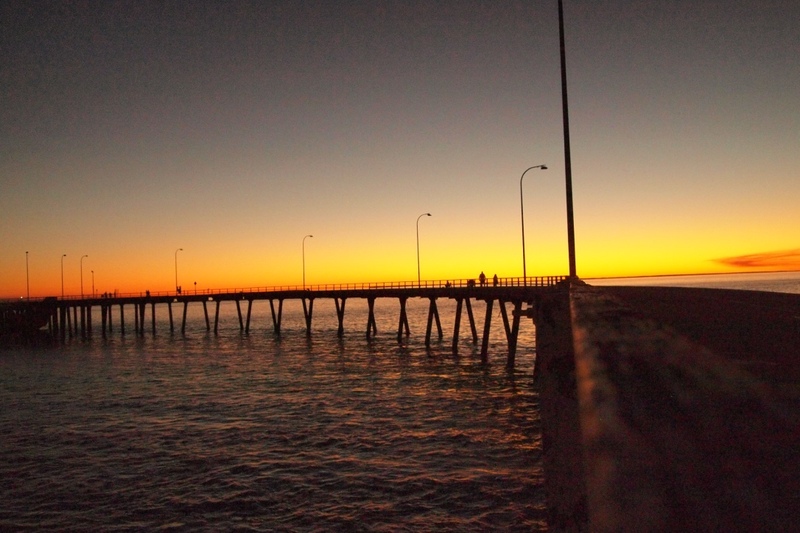 The little town of Derby on the coast of the King Sound and Derby boasts Australia’s highest tidal variation at 12m and is the western gateway into the Kimberley. 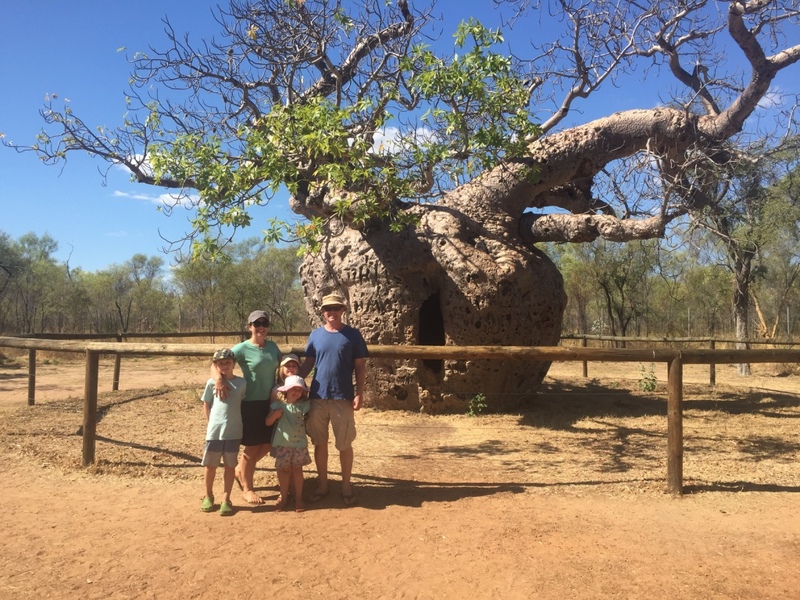 The town is the oldest town in the Kimberley, established in 1883, and therefore Derby has a lot of history with both the indigenous community in the north and the early settlements of sheep and cattle stations. 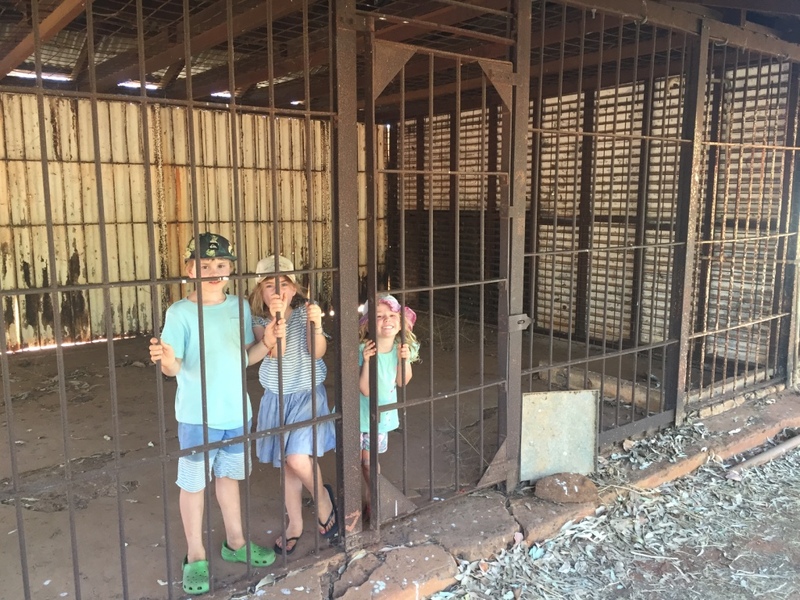 Derby has a port which has long provided services to the remote Kimberley communities and has also been a gate way for cattle export and still to this day the port is used for live export of cattle overseas. Derby today has lovely boab lined streets and is a tidy little town with a large indigenous community in Derby and the neighbouring indigenous community Mowanjum just on the outskirts of old Derby.We visited the local land marks being the unusual curved pier which at low tide stands above mud flats and at high tide can have water almost lapping the slats. In the main street of Derby they have what remains of the Derby Gaol and the sight of this facility brought tears to my eyes – the open air cells were used right up to 1975 and it is clearly obvious that the facility was inhumane. Whilst we were here in Derby it was very hot and at night very cool and it feels colder after a hot day. We were really shocked by this part of Australia’s history. 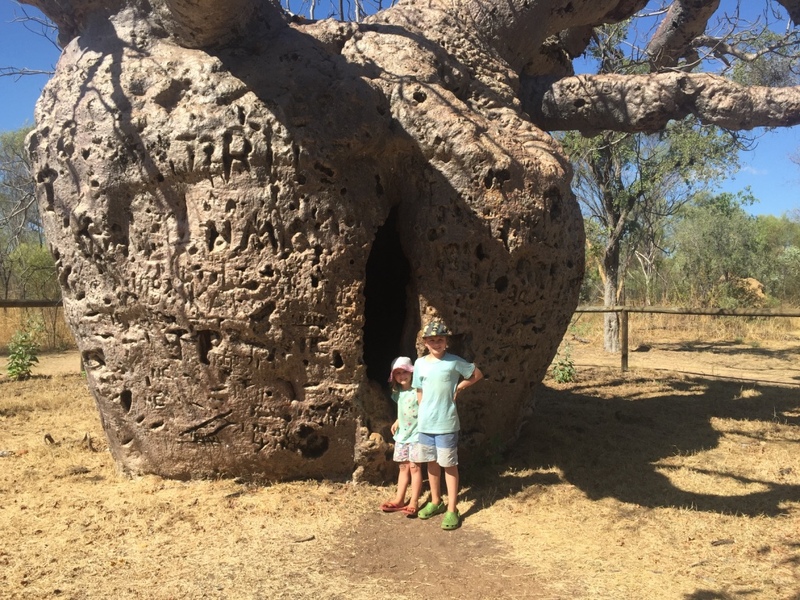 We also visited the Boab Prison Tree which is an ancient hollowed boab tree just outside Derby which was used between 1890s to 1930s for temporary overnight lockup of prisoners on the way to Derby Gaol. Sadly the majority of the prisoners were indigenous hunters accused of killing cattle or sheep which with the hindsight of time seems very unfair as they would not have understood that the grazing animals belonged to anyone. 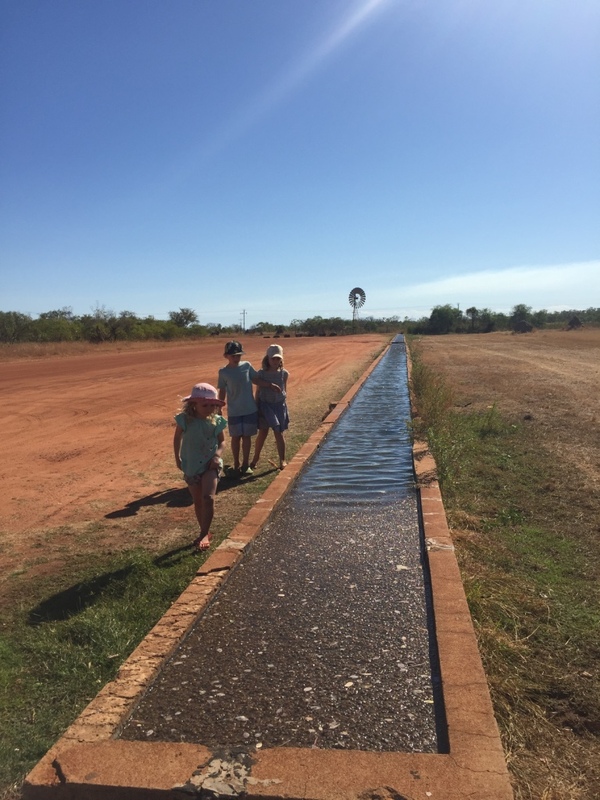 Near the Boab prison tree is Myalls cattle trough fed by a spring bore and over 100m long the old trough was used by drovers cattle herds moving into Derby for export. The trough still has water flowing today. 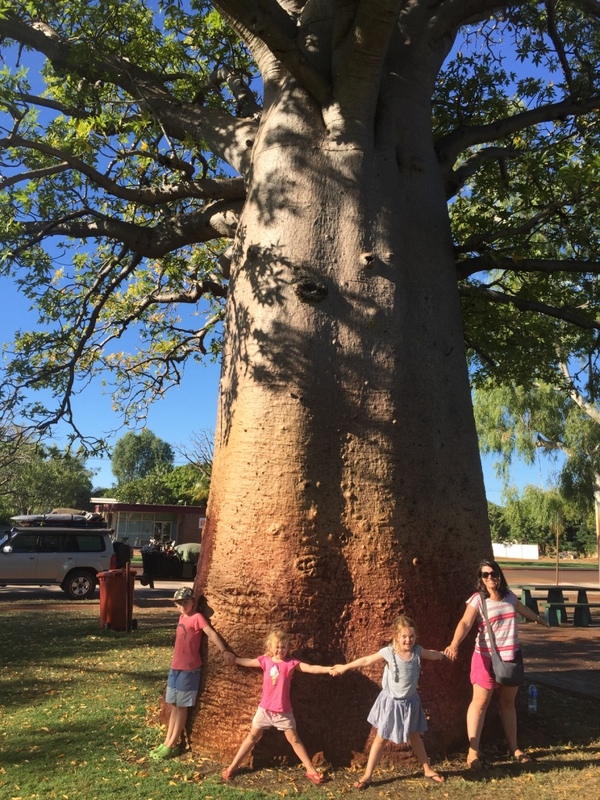 Also on the edge of town is a large old boab tree called the Dinner Tree which was a place where drovers met to have dinner and share a story after a long journey into Derby. The highlight of Derby was the Mowanjum Arts Centre which has the most beautiful indigenous artwork. The communities in the Kimberley has their own distinctive painting style of with haunting Wandjina spirits Andrew sensing danger ushered me out of the gallery – Andrew also wanted us to get to our camp site as we were warned all the camps along the Gibb River Road were very busy. 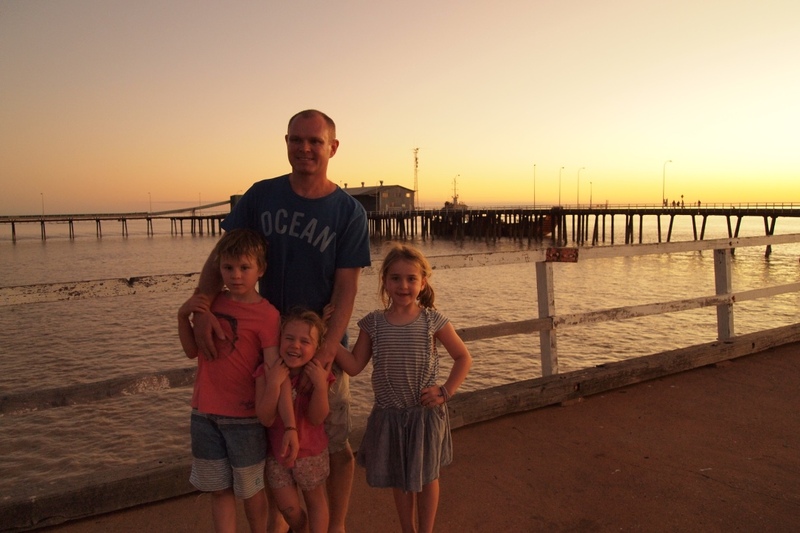 Whilst Derby is not a town where you would want to spend very much time it was worth a visit – lots of Australian history.